Edith Wharton’s Ethan Frome: I thought this would be a nice and short introduction to Edith Wharton. Ethan Frome is written as a series of flashbacks from the point of view of a visitor who sees an old and decrepit Ethan Frome. He slowly finds out more about Ethan’s unfortunate background from neighbors and Ethan himself. The book is depressing, but has some lovely descriptions of winter and snow. There is a heated debate online about whether Edith Wharton was a feminist or an anti-feminist. I haven’t read anything else by Wharton, but I’ll be perusing these discussions and adding more of Wharton’s books to my to-read list to try to come to a conclusion for myself. Have you read anything by Edith Wharton? What do you think: feminist or anti-feminist? R yu Murakami’s In the Miso Soup: This is not a book to read before you go to bed! As part of my newly proclaimed interest in Japanese literature, I decided to tackle Ryu Murakami, whom I’ve always referred to as “The Other Murakami.” However, this Murakami stands on his own! He is definitely not cowering in the shadow of Haruki. The story follows Kenji, a “nightlife” tour guide as he shows Frank, a creepy American around the red-light district. He suspects that Frank is a serial killer and ends up on a crazy adventure. The book is very gory and explicit at times, but the voice is confident, strong, and there are some vivid and lovely descriptions mixed in among all the blood. Cheryl Strayed’s Tiny Beautiful Things: Advice on Love and Life from Dear Sugar: If you haven’t heard of Dear Sugar by now, start here. This is a compilation of the advice column Dear Sugar that appeared on The Rumpus for a while with some never-before-published letters and responses. Cheryl is absolutely brilliant at mixing advice, tough love, and personal anecdotes into an advice column that will speak to you regardless of your problems. This book reads half advice, half memoir, and if you fell in love with Cheryl in Wild, this will send your heart over the moon with joy and love. This book would be a great present for anyone who is graduating, having trouble getting out of bed every morning, or experiencing any kind of turmoil in his/her life. Basically, read this book and buy it for everyone you know. Anthony Doerr’s All the Light We Cannot See: You already know that I read this for my first book club meeting. I would say of the Pulitzer-Prize winning books that I’ve read, this would fall to the middle of the list. However, out of all the books in the world, it would be somewhere near the top 25%. This is not your typical World War II book, and Anthony Doerr writes with a lyricism that feels very Old-World and charming. His love for science and nature really shines through the book, and that accounts for most of my favorite moments throughout the book. What did you read in June? What were your favorites? Have you read anything on this list? Hi Emma! I definitely try to read whenever I can – but there are still so many books out there I want to read! One of my worst habits is re-reading old favourites rather than reading something new…! What are some of your favorites? I don’t really keep a list, but I always have a few books on my Kindle and a stack of books on my shelf to get through. I definitely should make more time to reread old favorites, though! Urgh I’m terrible at re-reading old favourites, I feel a tad guilty though as always feel I should be reading something new! My favourite books include The Diary of a Nobody, In Cold Blood, Starter for Ten, Catcher in the Rye, Harry Potter (of course! ), All Quiet on the Orient Express…..I don’t have a genre as such I gravitate towards but I know what I like. I like some horror novels a lot too! I’ve only read half of your favorites, so I’ll have to look into the rest! I can’t read horror novels because I won’t be able to sleep at night – you’re much braver than me! Hmm I think some of my favorites would be One Hundred Years of Solitude, Flannery O’Connor + Truman Capote short stories, anything by George Saunders, and obviously Harry Potter, too! I think I’ve read all his works actually, apart from Breakfast at Tiffany’s – weirdly! I LOVED In Cold Blood which is what made me read his short stories and essays etc. Haha Starter for Ten sounds like my kind of bad-joke life! I looked it up and it looks really funny/interesting, so I’ll look for it at the library! Stephen King is too freaky for me. Side note – once I read Hannibal when I was in middle school and my dad had to sit in my room until I fell asleep, I’m such a weenie! You are definitely a cooool girl for reading Truman Capote instead of 50 Shades of Gray! Awww I love that!!! Nothing wrong with being freaked out from Hannibal 🙂 and your dad sounds like a great guy! I ran into the kitchen the other night because the trailer for Sinister 2 came on and I was by myself….!!! I felt I had a bit of ‘kudos’ reading Capote instead of trash!!! Lol! I LOVE Ethan Frome. I was completely floored by that book. Read it for a novella challenge two years ago and it still gives me chills whenever I think about it. The forbidden romance of that story was very close to home for me. Put into words for me some things I never thought I’d be able to express. I absolutely adored it. 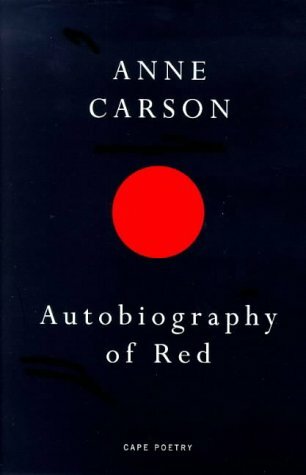 Autobiography of Red: I don’t remember anything specific about that book, other than how bizarre it was. It was recommended to me by a poetic genius (Caroline over at http://www.rosemaryandreadingglassess.wordpress.com). I’m convinced people should take her word for it other than mine. I really liked Ethan Frome too! It was my first foray into Edith Wharton. I didn’t really like any of the characters, but I liked her writing and the story. Didn’t you think Zeena was so mean and spiteful?